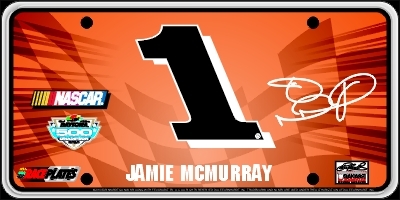 Signature Series Jamie McMurray - Our original souvenir line of plates, the Signature Series features dynamic background designs, large centered car number and the driver’s signature is prominently displayed. Our new 2011 Signature Series features all new designs with clean graphics and the raciest look yet. © 2011 Earnhardt Ganassi Racing with Felix Sabates, LLC. All rights reserved. Dale Earnhardt, Inc. trademarks and names are used under the authorization of Dale Earnhardt, Inc.